Split a bagel in half, smear on a little cream cheese, a slice or two of smoked salmon (Lox), a sprinkle of fresh dill and maybe a squeeze of lemon. Is this going to be good or...what? One of the very few breads that are boiled before baking. The boiling makes for a nice "chewy" texture. The bagel will stand up to any sandwich filling without falling apart. It is the perfect platform for piling on the toppings without the whole thing breaking apart and falling in your lap. How convenient is that? Once you get the hang of making your own, there will always be bagels around to knosh on. in enough flour to make a moderately stiff dough. gently enlarge the hole while working the bagel into a uniform shape. Cover, let rise 20 minutes. 4. Meanwhile, start a gallon of water boiling. Put 1 tablespoon of sugar in it, mix it around a bit. 5. 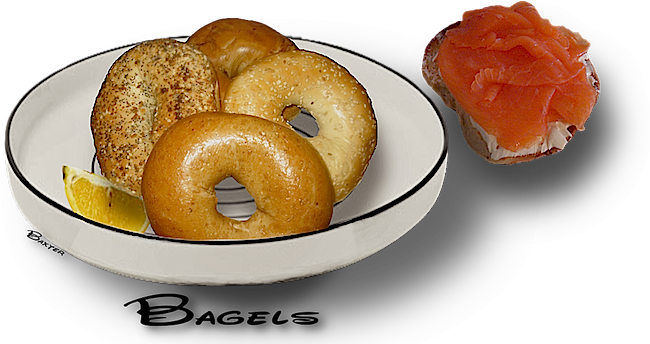 When the bagels are ready, put 4 or 5 bagels into the water, and cook 7 minutes, turning once. Drain them. **SEE COOK'S NOTE** Place on a greased baking sheet, and bake at 400ºF for 30 to 35 minutes. topping like a mixture of sugar and cinnamon. You can also leave them plain with no topping. For a glossier surface, place raised bagels on a non-greased baking sheet prior to boiling them. non-broiled ones, 25 minutes should be long enough. Note: do not bake broiled bagels as long as non-broiled ones, 20 minutes should be long enough.